Producer Genki Kawamura follows up his mega-hit Your Name with Fireworks, another tale of star-crossed teenage lovers with a sci-fi fantasy twist for a three-day theatrical event. Shy Norimichi and fast-talking Yusuke are goo-goo-eyed over the same elusive classmate, Nazuna. But Nazuna, unhappy over her mother’s decision to remarry and leave their countryside town, plans to run away and has secretly chosen Norimichi to accompany her. When things don’t go as planned, Norimichi discovers that a glowing multi-color ball found in the sea has the power to reset the clock and give them a second chance to be together. But each reset adds new complications and takes them further and further away from the real world – until they risk losing sight of reality altogether. 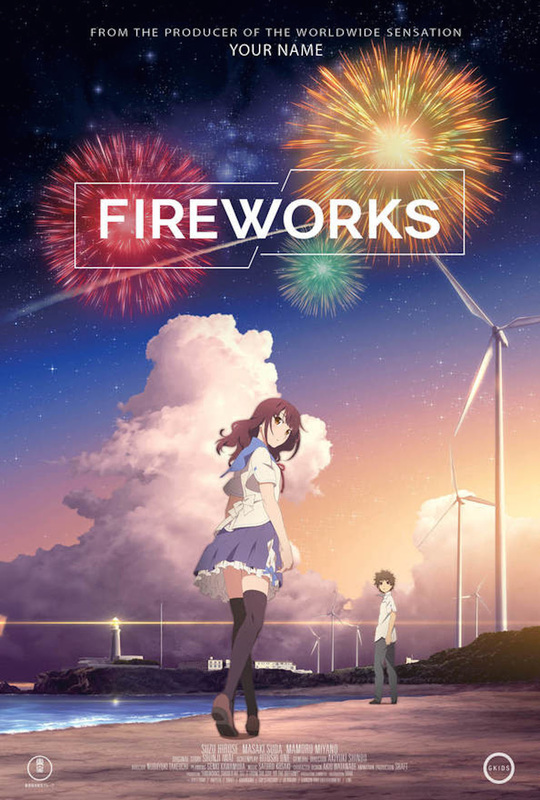 Fireworks tells a simple story of adolescent longing that taps deep wells of emotion. It is tale of youthful wistfulness, missed opportunities and long-ago dreams, of the urgency of young lovers, and the desire to create a separate universe, a magic place outside of time, where they can be together. Please note: Some screenings are in Japanese with English subtitles, and other screenings are dubbed in English. The format is indicated on the day and time you select. For a full list of theaters and to purchase tickets, please visit gkidstickets.com.